PV-RC200HD2/KR model also has the ability to balance out dynamic range of the images. The integrated Wide Dynamic Range feature allows to take better pictures of situations where the light falls on the camera instead of a person, or his/hers face. Sometimes the entryways of buildings make abrupt changes in dark and light conditions. WDR makes sure that the picture has a balanced out brightness/darkness ratio, and together with the HD recording it allows simple usage, and reliable material. 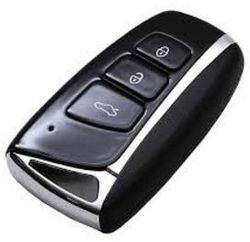 Hardware switchable VGA/HD mode and Vibration ON/OFF: By removing the lid, you gain access to the SD Card slot, USB connection, and the two switches that control the resolution and vibration mode. This is a great improvement in the PV series, as the older models had buttons that were difficult to access especially if you were in a hurry. Now you can move the left switch for resolution, and the right for vibration adjustment.